ABOUT THIS PRESS CONFERENCE & INTERVIEWS: Following their show at the Hollywood Bowl on August 23rd, the Beatles took a couple of days off to relax in Bel Air. The group then flew to Denver, Colorado for their outdoor concert at Red Rocks Amphitheatre on August 26th. 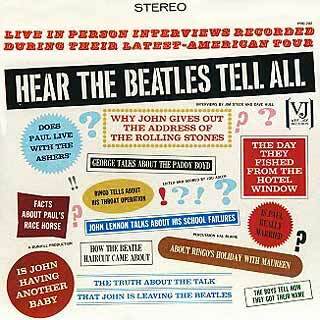 Denver was the 6th stop of 24 cities along the Beatles' whirlwind 1964 North American tour. 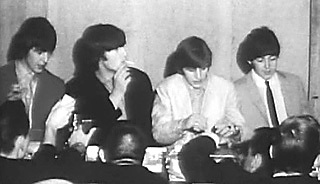 The Beatles gave a press conference just before before their performance at Red Rocks, as well as various one-on-one interviews following the press conference. The existing clips of the Denver press conference are presented below, along with two interviews from that day -- one conducted by news reporter Pat Murphy of KOA, and the other by Dave Hull from KRLA radio. Things get a little testy in Pat Murphy's interview with John and Ringo as he needles them about a minor incident with the press in an elevator earlier that day. In the Denver press conference, George briefly mentions the controversy involving their room accomodations at the Hotel George Washington for their upcoming tour stop in Jacksonville Florida two weeks later. This was due to the Beatles support of the civil rights movement and their objections to racial segregation. 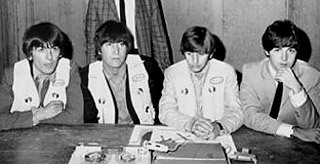 Although it is played down slightly in Harrison's press conference response, he makes the Beatles' intentions known. Q: "George, I understand that from here you're going, later on next month, down south. I understand you're pretty against the segregation down there and we understood there were some problems about the hotel you might stay in in Jacksonville." GEORGE: "We don't know about our accomodations at all. We don't arrange that. But, you know, we don't appear anywhere where there is." In the end the Beatles would choose different lodging during their Jacksonville visit. Independent of this, the Gator Bowl, the venue for the Beatles' Jacksonville concert, gave the band assurances that audience seating would not be segregated by race. 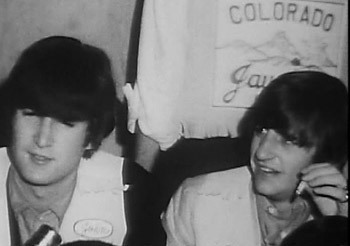 The Beatles are made honorary members of the Jaycees at this press conference and are each given white Jaycees vests with their first names embroidered on the left breast. Q: "What about this rumor that John is leaving the group?" JOHN: "It's just a rumor. I dunno how it started. You know, it's just untrue." Q: "When do you plan to come back to the states? We are all here from various parts of the country and... for example I'm from Phoenix... and we want to know when are you coming back so we can get you down there." JOHN: "Yeah, I don't really know, you know. It's up to our manager when we come back again. It'll probably be next year at the earliest." Q: "Ringo, did you see the reception that we gave you at the airport?" RINGO: "Yeah, we went 'round it. Very good! Marvelous!" Q: "Ringo, have you seen Red Rocks?" Q: "Have you ever been to see this kind of amphitheatre?" Q: "George, I understand that from here you're going, later on next month, down south. I understand you're pretty against the segregation down there..."
Q: "...and we understood there were some problems about the hotel you might stay in in Jacksonville." Q: "The thing is, when we (the press) followed in the elevator, we had a little unpleasant experience." RINGO: "Well, you jumped in the lift, you see, and weighed it down." Q: "Oh, is that what it was, yeah? Are you mad at the press?" JOHN: (dryly) "We're never mad at the press." Q: "We got the impression you might be a little rude... a little upset." JOHN: (snapping back quickly, but calmly) "We're only as rude as the people we meet." Q: "Well if thats true, you certainly had no occasion to think we were rude, didya John?" JOHN: "I didn't even see you, actually." Q: "Well, somebody made a remark at the back of the elevator." RINGO: "Yeah well, the thing is... The lift was crowded anyway, and then the press try and jump in, you know." Q: "Let me ask you both this. Have you ever tried to come into a city unannounced, rather than cause all this furore?" JOHN: "Yeah, George and I passed through Los Angeles on our way back from a holiday in Tahiti, unannounced. And we just did a trip 'round, because we had about four hours. So we just went 'round to L.A. and nobody knew at all. Several people spotted us, but they thought we were fakes." Q: "How has your tour been so far? You go from here to where next?" RINGO: "I don't know. Where do we go next?" Q: "And you've enjoyed everything so far?" Q: "Do you have this crowd wherever you go?" 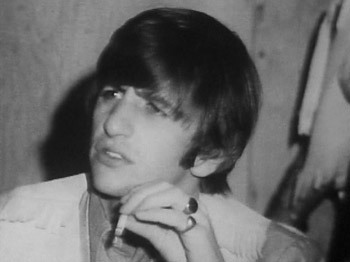 RINGO: "Up to now, yeah." JOHN: (jokingly) "Even in the lift!" Q: "What is your favorite part in 'A Hard Day's Night?'" JOHN: "Uhh, the bit in the field." Q: "Mine too, but what about the bathtub?" JOHN: "Oh, yeah, I don't mind that. But I prefer the bit in the field." Q: "Now is it true that some of the stuff was spontaneous, John?" JOHN: "All the bit in the bathtub was. The idea wasn't. They just run it and I just had to do whatever I thought of in the background." Q: "What about the other fellas, did they do things too that were spontaneous?" JOHN: "Well, there's quite a lot of it that's spontaneous... only you can't, really 'cuz you've got to do so many takes, even if say the four of us are there, and one of us thinks of a gag, ad-lib, you throw it in, but something in the background was wrong, so you've got to do it again. So they're not ad-lib at the end. We stuck quite a lot to the script, you know. Some of the gags were us, or the director, you know. He threw quite a bit in, too." Q: "John, may I ask you... it's been rumored that the next film that you are preparing to write now... have you started writing the next film?" JOHN: "No, I'm not writing it at all, you know. That started because I had a book, a short story, at home which I thought would make a good film if it was rewritten. And that's how it got 'round that I was gonna write it, you know. But I haven't got time, I don't even think I could, anyway." Q: "Well it's been rumored that it's gonna be filmed in Hollywood. Can you tell us whether it is or it isn't?" JOHN: "No, it's definitely not being filmed in Hollywood. It'll be done in England. It's cheaper. And you know, it saves us going away from home as well." Q: "John, tell me if you've yet moved into your home in Surrey." JOHN: "No, I haven't had time. The place is empty, you know. There's no furniture... needs decorating, and walls knocking down and things. It's nowhere near ready. I'll be in next year, probably. Well, I hope before. It depends, but that's the longest it'll take to fix it up." Q: "And John, they said that you had moved to Emperor's Gate. Are you moving out of there and into the Surrey home, is that it?" JOHN: "I've moved from Emperor's Gate, but not into the house, you see." RINGO: (to Dave) "Yeah... sneaking on the planes, eh?" Q: "Shh, don't say that." RINGO: "They caught you though, didn't they?" Q: "Did you think of the title of 'A Hard Day's Night?'" Q: "How did you do it?" RINGO: "I don't know, it just came out. We went to do a job, you know. And we worked all day, and we happened to work all night, and I came out still thinking it was day, I suppose, and said, 'It's been a hard day...' looked around and it was dark, and said 'night'. So we came to 'A Hard Day's Night.'" Q: "What about your throat? I understand you're going back into the hospital this fall for a throat operation. Would you tell us about it?" RINGO: "I'm just going to get them out, you know, me tonsils. There's nothing the matter with them now, they've cured 'em, but all they're worried about is if they can go again. So once they're out, it's finished, you see." Q: "What about your father's horse?" Q: "Drake's Drum. Are you planning on entering Drake's Drum in races in the US?" 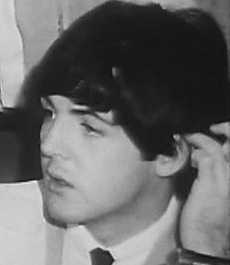 PAUL: "Oh, I see. It's nothing to do with me, you know. It's me dad's horse, and I didn't buy it for myself, I only bought it as a birthday present for him, so if he fancies entering it, you know, let him. Good on him. It's doing okay, though. Won last time out." Q: "I know. And it came in second on the first time out?" Q: "Well, then you've had two places in two starts." PAUL: "Yes, very good, it was." Q: "Then you're in no way connected with Drake's Drum at all?" PAUL: "Well, I mean, I bought it for me dad, but it's not mine or anything, you know. I have a bet on it." Q: "Beautiful. What about your favorite part in 'A Hard Day's Night?' Which one was it? Can you recall?" PAUL: "Favorite bit of it? Umm... the field." Q: "Very good. That's my favorite too. What about any of the other parts, can you think of..."
PAUL: "Ringo's bit was the bit I liked as well, you know. I liked the bit in the field best, and then all Ringo's stuff, with them playing 'Ringo's Theme' over it. 'This Boy.'" Q: "Yeah. By the way, why did they choose 'This Boy' to be Ringo's theme, was it his favorite, Paul?" PAUL: "Well, I think he likes it, you know, as a song, but it was just... it fitted in, you know. That was the main point, really."